Easter Sunday is when we celebrate the resurrection of Jesus Christ from the dead. As an Easter people, this is something that Christians should really do every day but please come and take part in this special celebration. 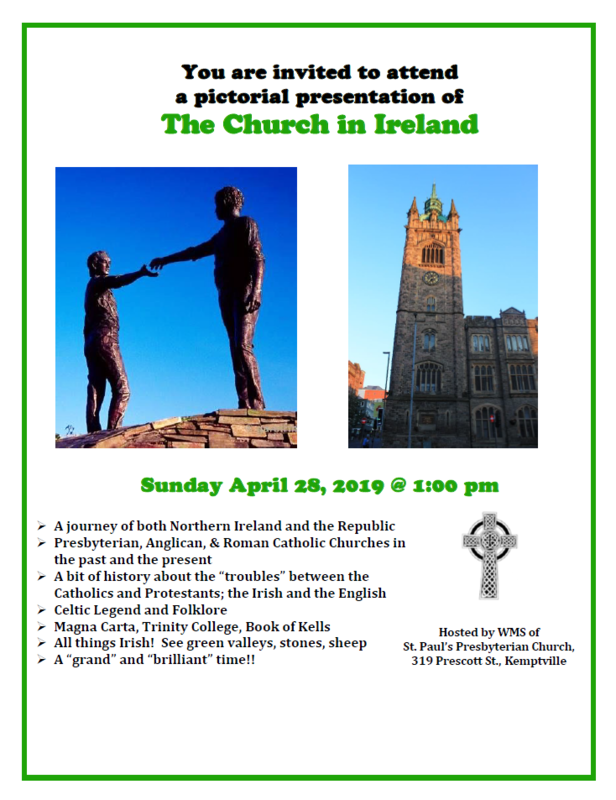 Come and join us for a pictorial presentation of The Church in Ireland Sunday April 28, 2019 @ 1:00 pm. Hosted by WMS of St. Paul’s Presbyterian Church, presented by Janet Stark. 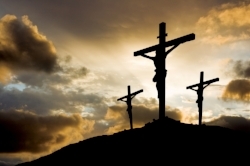 Good Friday commemorates the crucifixion of Jesus Christ and his death at Calvary. We will mark this important event through a joint worship service with our brothers and sisters from St. John's United Church, here at our church, starting at 7PM. Palm Sunday marks the start of what is often called “Passion Week,” the final seven days of Jesus' earthly ministry. 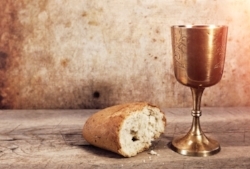 Come celebrate the triumphant entry of Jesus into the holy city of Jerusalem, as well as The Lord's Supper. This very popular community supper is put on every year by the young people of St. Paul's who dish up plates of spaghetti with loads of delicious salad and lots of dessert. There are two sittings at 5:00PM and 6:30PM. Tickets are $12 for adults and $6 for children (4-10). Kids under 4 are free. Please note that Margaret Birnie will be using the church kitchen today to make another batch of her delicious shortbread. St. Paul’s will be holding its very popular Fish & Chips Dinner on Saturday, March 23rd in the church hall at 319 Prescott Street. There will be two seatings at 4:30PM and 6:30PM. Tickets are $15 for adults and $7.50 for children under 12. For tickets or details, email stpaulsdinner2018@gmail.com. The World Day of Prayer is a global ecumenical movement which brings Christians of many traditions together to observe a common day of prayer each year. Through preparation and participation in the worship service, we can learn how our sisters of other countries, languages and cultures understand the Biblical passages in their context. We can hear their concerns and needs and can join in solidarity with them as we pray with and for them. In this way, it is possible to enrich our Christian faith as it grows deeper and broader in an international, ecumenical expression. Come and have a say in the life of your church. At our annual congregational meeting, members will hear reports from our various organizations, review financial statements and make plans for the year ahead. Join us for an informal panel seminar and discussion on the medicinal and recreational use of Cannabis. Topics include - Why medical marijuana has become an accepted treatment, common myths and misconceptions, the difference between CBD and THC, as well as how we can keep our children safe. Admission is free. All are welcome. Celebrate Christmas Eve at St. Paul’s with our family-friendly service at 7PM. Along with music and readings, there will be a dramatic presentation. After the service, stay for hot apple cider and sweets. Come sing some of your old favourites at St. Paul’s this Sunday. The service starts at 10:45AM and will feature traditional carols. The St. Paul’s Church School will be conducting the service this Sunday. There will be a lunch following and a special visit from Santa. Everyone is welcome. 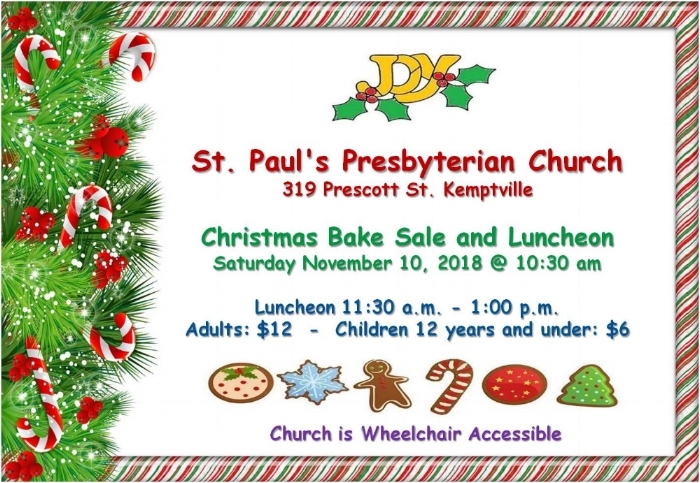 St. Paul's Annual Christmas Bake Sale & Luncheon will be on Saturday November 10, 2018. Come out and enjoy the fellowship, the delicious homemade bake and the great Luncheon. St. Paul's is wheelchair accessible. All are welcome. The Session of St. Paul's will meet at the church starting at 7PM. The Presbyterian mission in Barrhaven will be holding a bazaar and fundraiser for the Barrhaven Food Cupboard on Saturday, October 6th. It will take place at the Larkin Community House and volunteers who can help during the day would be greatly appreciated. They are also accepting - garage sale items, baked goods and books. Please contact the Reverend Shahrzad Kandalaft for more information. Come celebrate our 167 years of faith and ministry in the North Grenville area. A hot potluck lunch will follow the service. All are welcome. A sign-up sheet for food items is in the church hall. Everyone is invited to Mountain Orchards for a fun afternoon of apple picking and other activities. Orchard activities are free - apples and other treats are available for purchase. Please bring a lawn chair and feel free to bring a picnic or snack to share with the group. Anyone who needs a ride can car pool from St. Paul’s at 12:30PM on Saturday, September 29th. Alternatively, we’ll meet at the Orchard for 1PM. Mountain Orchards are located at 10175 Clark Road in Mountain, Ontario. After over 30 years at St. Paul’s, Robert and Susan Wood will be moving to Fenelon Falls to be closer to family. Please join us for a pot luck lunch after the service on Sunday, September 23rd. Come wish Robert and Susan well as they embark on their next adventure! The Brockville Presbyterial of the Women’s Missionary Society will meet on Saturday, September 22nd at Riverview Presbyterian Church in Iroquois, Ontario. Sign-in begins at 9:30AM and the meeting gets underway at 10AM. Lunch is $12. Please register in advance with Catherine Blatch (613-923-1571 or catherineblatch@gmail.com) if you plan to stay for lunch. The theme is “Bringing Darkness to Light in Palestine” with presentations by the Reverend Noel Gordon and the Reverend Dr. Dorcas Gordon, as well as Ruth Pollock, Dorothy Herbert and Alan Herbert. All are welcome. 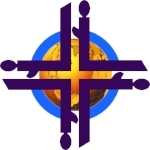 Presbytery will meet on Tuesday, September 18th at First Presbyterian Church, Brockville. All are welcome to attend. The Food Drive will run until Thanksgiving Sunday (October 7th) and everything will be used, through the local food bank, to support families in our community. Founded in 1988, Science Quest is a not for profit science, technology, engineering, and mathematics (STEM) based program operated at several locations throughout Eastern Ontario. Science Quest strives to engage and empower youth - from Junior Kindergarten to Grade 8 - through our educational, hands-on camps. This is the first year that they will be in Kemptville. The congregation and church school will hold its annual service and picnic on June 24th at the Baxter Conservation Area. We will hold an outdoor service, followed by a picnic lunch and then games for the kids. If you need directions, please ask the Minister or the ushers on duty. The General Assembly, which meets annually, is the highest governing body of the Presbyterian Church in Canada. Delegates from across the country, both ministers and ruling elders, gather to discuss policies and other concerns of our church. This year, General Assembly will be held in Waterloo, Ontario. Proceedings will be live-streamed and can be found at www.presbyterian.ca. The Sessions of St. Paul's and Knox will meet following the service in Kemptville. Our Minister, Samer Kandalaft, also serves the congregation of Knox Presbyterian Church in nearby Mountain, Ontario. We get together for many shared events but every year we like to come together for a communion service. This June, it will be held here at St. Paul's. All are welcome.